The Movement for Good Governance (MGG), the country’s foremost non-partisan, multisectoral citizens’ movement, is launching a pioneering election tool for voters called the Scorecard that will enable citizens to vote wisely in the upcoming May elections. The MGG Scorecard is the first of its kind in Philippine politics. It is a simple and effective guide to evaluate candidates based on three key leadership criteria: effectiveness, empowering, and ethical leadership. The criteria was initiated by MGG using diverse local and international governance benchmarks from Gawad Galing Pook, the World Bank, and the UN. The scorecard was finalized with the assistance of the Personnel Management Association of the Philippines (PMAP), the country’s leading human resource organization. 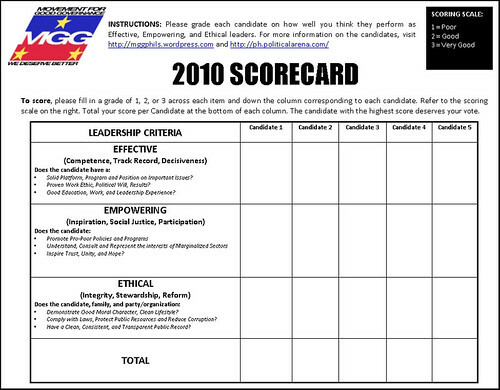 The MGG Scorecard (see attached) uses three equally vital leadership criteria and simple guide questions. It looks at a candidate’s effectiveness, or their ability and track record to perform their duty; empowerment, or a candidate’s ability to unite and engage stakeholders to develop and implement policies and programs that meet genuine needs of the populace; and, ethical, which affirms the need for the candidates integrity and character. “These three complementary traits are all necessary for our country to be governed as we deserve, and the scorecard allows voters to grade candidates on each criteria using simple guide questions. It also ranks the candidates’ total scores — on a basic 1 to 3 score — to determine who among them meets these traits the best,” says Dr. Milwida Guevara, MGG founder and Gawad Haydee Yorac Awardee. The scorecard will be shared through MGG’s coalition in the remaining dates of the elections to enable Filipinos to make 2010 count. MGG partner PoliticalArena.com has provided both free mobile and internet access for citizens to add to their information to evaluate candidates effectively to make it easier for citizens to compare facts and actual data on candidate’s performance, personal character, and leadership traits. “As a pioneering tool for the Filipino voter, we aim to use and continue sharing this not only in 2010, not only in future elections, but also in helping citizens develop a mindset for identifying and choosing excellence in their public leaders. In doing so, they transform themselves into an empowered, vigilant, and demanding citizenry that is vital to making democracy and development work in the Philippines,” Guevara added. The scorecard may be downloaded from MGG partner websites and will be disseminated to key cities and communities up to election day. Whatever the otocume of the election is, I don’t think that their will be major changes in society. The scenario would still be: “the rich gets richer, and the poor gets poorer”. Only a change in the system of government can stir this country to a better future. People are flocking to Metro Manila to look for jobs and a better chance to uplift their way of life because most of the multi-billion infrastructures are in the area while the rest of the country don’t get much of the infrastructure needed to promote trade and industry or even agriculture! While most of the taxpayers live outside metro manila and don’t use the infrastuctures there, they are obligated to pay for these infrastructure because the taxes that they paid are part of the funds used for these infrastuctures! I haven’t heard any of the candidates for president saying that if they get elected, they would redistribute the wealth.